There are hundreds of bookstores throughout the United States that offer some form of free Wi-Fi Internet access to the public. Get online for no charge with free wifi at these bookstores. Barnes & Noble - Now Barnes & Noble in conjunction with AT&T Wi-Fi service offers no fee, no charge wifi at every store. "We have always wanted our stores to feel like home—a place where people can relax, explore and connect with ideas and each other at their leisure. So it is only natural that, in today's world, we want our customers to enjoy complimentary Wi-Fi. 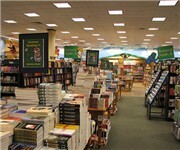 You can explore the world the way you always have at Barnes & Noble with the technology that connects us to the world today." Bookman's - An Arizona institution for over 30 years, Bookmans Entertainment Exchange has built our reputation on the concept that "used" is not a dirty word. With six stores in Tucson, Mesa, Phoenix, and Flagstaff, we rely on our customers for what we sell - books, music, movies, video games and systems, magazines, comics, electronics, tchotchkes, and musical instruments, and more. That's nearly 114,000 combined square feet of media recycled from the community. Bookman's provides free wifi internet at all locations. Borders Books & Music - Borders Books, provided by Verizon offers free Wifi access with no password or access fee. Borders has previously offered Wi-Fi through T-mobile hotspots, but it hasn't been free. Good books, gourmet coffee drinks and free WiFi -- that's what shoppers are now able to enjoy at "virtually" all Borders Superstores across the country. Below is a list of popular bookstores that are currently offering free Wi-Fi. Do you know more bookstores with free wireless?